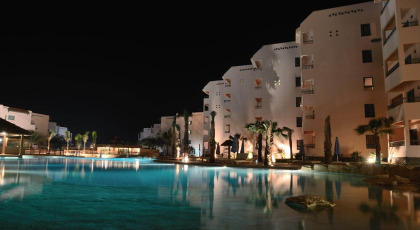 A beautiful, exotic location where desert meets ocean, provides a fascinating setting for the gorgeous Zahabia Hotel & Beach Resort, only 10 minutes from the International Airport at Hurghada. 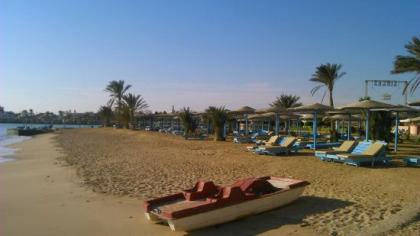 All around the resort are mesmerizing views of the warm, clear blue waters of the Red Sea and the enchanting natural environment of this unique area. 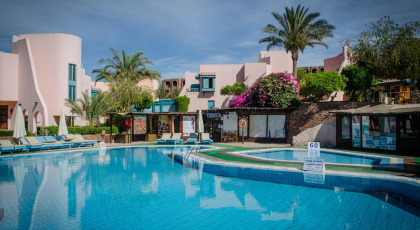 These Hurghada timeshares for sale at Zahabia Hotel & Beach Resort will provide you with wonderful holiday options in this fascinating part of Egypt. Studio, one and two bedroom timeshare apartments, and two and three bedroom villas encompass an expansive central pool. Landscaped gardens filled with fragrant flowers and greenery add peace and serenity. Spacious accommodations offer kitchens with dining area and a large living area with seating, Satellite TV, phone, and sofa bed. Bathrooms are tiled and modern. (Larger units have two bathrooms) Villas feature a terrace or garden. All timeshare units feature air-conditioning and heating. Valet and laundry service is available 24 hours. Zahabia Hotel & Beach Resort’s private beach overlooking the famous Griftun Island is one of the best diving and snorkeling spots in the country. Just beneath the surface of the sea are over 1000 species of fish and coral. Choose from four different resort pools (two for children) for swimming and sunning. Daily activity programs and a Kid’s Club keep everyone entertained. Enjoy a 24-hour bar and a restaurant serving breakfast, lunch and dinner. 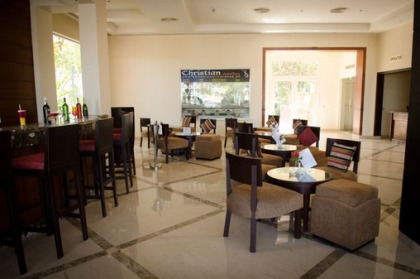 Use the resort’s Excursion Desk to take advantage of the opportunity to visit some of the famous ancient sites of Egypt. Luxor and the Valley of the Kings can be reached by a three hour car ride. Contact Zahabia Hotel & Beach Resort Hotel Specialist Today!